The COE premiums for cars above 1,600cc or 130bhp and the Open category hit an eight-month high despite the Chinese New Year break. 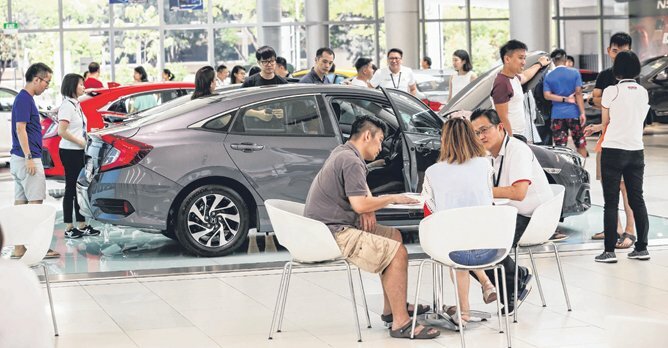 Premiums for Certificates of Entitlement (COEs) finished mostly higher in the latest tender yesterday, despite the Chinese New Year break, with bidders competing for a smaller supply of certificates. The only exception was in the category for cars up to 1,600cc and 130bhp, which ended 1.8% lower at $25,689. The premium for cars above 1,600cc or 130bhp finished 1.5% higher to hit an eight-month high of $34,509. Likewise, the Open category - which can be used for any vehicle type except motorcycles but, which ends up used mostly for bigger cars - rose by 4.8% to close at an eight-month high of $35,310. Mr. Samuel Yong, Marketing Director for Toyota and Lexus distributor Borneo Motors, said the results reflected the stronger bidding power of big-car buyers. Mr. Nicholas Wong, General Manager of Honda agent Kah Motor, concurred, saying "this segment is more recession proof". But Mr. Wong also noted that the latest results may have been driven by "panic buying" and "hoarding". COE supply for the February-April quota period is around 10% smaller than the previous three-month period. "This might have spooked the market," he added. But he reckoned that buyers may not accept the higher prices. If so, premiums should ease in the coming tenders. Meanwhile, the commercial vehicle COE crept up by 0.6% to end at $26,378. But motorcycle premium shot up by 28.4% to close at $3,709. Mr. Wong, who also oversees motorbike sales at Kah Motor's sister company Boon Siew, said the 20% price drop in the previous tender had triggered strong buying in this round. Combined with a sharp shrinkage in supply this month, two-wheeler COE shot back up. Bid COE yourself - I tried it! Renew COE or Buy pre-owned?